In April of 2005, Jon came in to Jade's Studio to order a custom pendant to give as an engagement present, in lieu of a ring. The amazing story of what followed was too perfect not to share. You got married?! How?! What?! How?! Three excellent questions. First, take a deep breath. Whew! OK. How about starting with how you met? Sure! I usually ride my bike to work, but on the fateful morning of June 1, 2004, it was raining, so I rode the subway. A woman sitting across from me kept smiling at me and glancing at what I assumed was the book in my hands. Since the book in question was one written by Mr. Lemony Snicket, I figured she was simply amused by my choice. She got off the train after only two stops before I could say anything to her, but I did take note of the book she was reading, something called On Longing. That day at work, I could not get this woman out of my head. Finally, just before I left to go home, I did something I've never done before (really!) -- I posted a "missed connection" on Craig's List (even as I write this, I can't believe I did it). I mentioned "On Longing" and Lemony Snicket -- just enough info to catch her eye if she happened to be reading, but not too much to invite mean spoofers. A couple of hours later -- I got a response! Problem was, the response was rather vague. It said simply "Nicely spotted. Here's a particularly savoury bit of On Longing for your troubles" and then quoted from the book. I couldn't tell if she was The One, or if she was spoofing me, or if she was someone who simply liked the book and wanted to share that fact with me. So I googled her Hotmail email address. And got a few hits! They were all from four years ago and all seemed to be entries in other people's personal web guest books. In one of the entries, she gave out some personal info -- she was about to turn 40 and lived in Sweden. Well, I suppose this woman could have moved here from Sweden in the last four years, but no way was she 44. I figured she was probably someone who simply liked the book. I decided to ignore her and didn't write back. Two days later I get another email from her with nothing in the message body. Just a subject line with a single word: "Quitter!" I wrote her back, asking if she was the woman on the subway, and she replied that, yes, she was! Skeptical, I quoted the website with her guest book entry and asked her to describe one of us so that I'd know this wasn't a prank. She replied with a description of herself that left no doubt it was her. And she said she was 28, not 44. Despite this flurry of what could easily be interpreted as weird and/or rude behavior on my part, she agreed to meet me for coffee. Exactly one week after our subway encounter, we met at a local coffee shop. We hit it off well enough that a few days later I took her out for dinner and a concert by the Decemberists, a band we both like. We've been seeing each other ever since. So what about that 44 year old Swede? I know! I didn't get the answer to that until we met at the coffee shop. Her Hotmail address was one that she had acquired just that day, specifically to answer my ad. Someone else must have had that address four years ago and let it expire. And was she smiling at you because of the Lemony Snicket book? No! She hadn't even heard of the books (a problem which has since been rectified). She told me later that she was admiring my hands! So the relationship blossomed, you fell in love, yadda yadda yadda? Skipping ahead, when did you decide to get married? Yeah, things were going great! By April, 2005, I'd been thinking about marriage for awhile, but I wanted to do something really special. "Future Wife" (henceforth known as FW) had made it very clear that she didn't want an engagement ring. FW doesn't wear rings in general and a fancy diamond ring is definitely not her style. Instead, in honor of how we met, I thought I would get her a pendant of a Boston subway token. I would give it to her on our one year anniversary, and maybe ask her then. A friend recommended a jeweler named Jade Moran, so I visited her studio and we went over some design ideas. At the same time, FW was getting antsy for a commitment. This wasn't just a stereotypical female thing -- she's a grad student who'll be on the job market soon, and she didn't want to limit herself to the Boston area if I wasn't going to stick with her. I kept assuring her that I was going to ask her to marry me, but that, as I said above, I wanted to make it special. You told her you were "going to ask her"? Are you an idiot? Apparently so. Note to all single guys reading this: Never tell a woman that you are "going to ask them" to marry you. It doesn't work and only makes things worse. At one point, in an effort to convince her that I was serious, I emailed her that I was working on a scheme -- that I wanted to give her a token of my appreciation. Get it? A "token"?! Yeah, I got it. Did you really say "token"? I did! It was a joke intended only for me, but later that day, on the phone, she told me that when she read "token", she was worried that I was going to give her a subway token pendant. A friend of hers already had one, plus she doesn't like gold or brass colored jewelry. OMG! What did you say? It was a good thing we were on the phone, because my jaw dropped like a Tex Avery cartoon character. I just laughed weakly and assured her that I'd never get her something like that. What did you do? Was the jeweler already working on the token pendant? No, I'd only met with the jeweler once or twice at that point and hadn't finalized anything. I regrouped and reread some of our early correspondence. Inspiration came to me from my very first message to her on Craig's List. I would give her a pendant of a tiny book! The spine would read "On Longing", while the other edges, where the pages are, would have our initials and the day we met. I immediately met with Jade and we finalized a design. That's all well and good, but surely your girlfriend wasn't getting any less antsy? No she wasn't (and stop calling me Shirley). At the end of April, after a Mission of Burma concert, and some intense conversations during which she convinced me that she really really didn't need anything from me other a sincere proposal, I sat her on my couch and, with tears in both our eyes, asked her to marry me. She said yes without a moment's hesitation. Awww! But wait -- you got married a month later? Yep. We both decided we wanted to make the wedding very small and quiet, so we made an appointment at Somerville City Hall for June 1st - our one year anniversary. I half-jokingly suggested the date because it would mean we'd only have one day to remember instead of two, but the more we thought about it, the more we liked it. Did you bag the pendant idea? Of course not! I was going to give it to her on June 1st anyway, so it just transmorgrified into a combination surprise wedding/anniversary gift. Were there any wedding plans to be made? We hired one of FW's ex-roommates, who's a professional photographer, to take pictures; I asked one friend of mine, who'd given me some good relationship advice over the last year, if she would come; and we also ordered rings. I thought she didn't like rings? I know! But she said she'd make an exception for a wedding band. At this point it was two weeks before the wedding. I assumed we wouldn't have enough time to get rings before the ceremony, but we figured we could order them later. You just said you ordered rings. Right. What happened was, right after our discussion about the rings, I visited Jade Moran's studio, to get an update on the pendant. I mentioned that its purpose had changed -- that I had already proposed and we were getting married soon. She asked if we needed rings. She said she could definitely get them done before the wedding. Jade showed me some of her samples and I found a couple that I thought FW would really like. I brought her to Jade's studio, she agreed with one of my suggestions, and we ordered the rings right away. Wait a minute. You brought her to Jade's studio? Were you worried that you or Jade would ruin the surprise of the pendant? A little bit, but Jade was great and played along. I told FW that a friend had recommended Jade (true!) and that I'd wanted to scout out her stuff in advance of telling FW about her (mostly true!). This allowed FW and I to visit Jade with a minimum of deception of the part of Jade and myself. Jade acted like we'd just met once briefly, and even spelled my name wrong in her notebook. So the pendant -- It stayed a surprise? How did you give it to her? 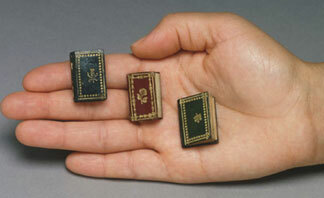 In another Tex Avery cartoon character jaw-dropping moment, a few days before the wedding, FW emailed me a link to a press release about an exhibit going on in one of the Harvard museums -- an exhibit of tiny books. Way. That evening, I mentioned to her, real casual-like, that I'd like to check out that museum. She replied that it might be tricky since it's only open weekdays from nine to five. I suggested that we stop by after the wedding. The ceremony was at 2pm and we had a dinner reservation at 7:30, so we'd have a lot of time to kill. She loved the idea. Everything had fallen into place! Sweet! So how was the big day? It couldn't have gone more perfectly. I picked up the pendant the night before. Everyone arrived at City Hall in plenty of time. The city clerk conducted a brief but poignant ceremony in the Aldermanic Chamber. My friend brought a bottle of champagne that we knocked off next door on the lawn of Somerville High School. The wife (!) and I then went to Harvard Yard to visit the museum. The exhibit was all in one room. It was two rows of four tables, all with glass tops and the tiny books under the glass. We walked from table to table. When the wife (!!) 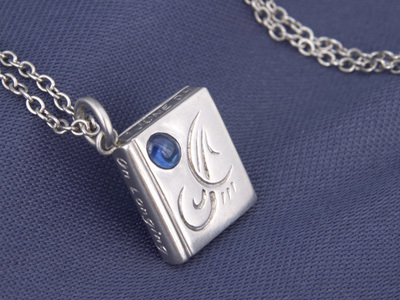 got to the last table, I lingered at the second-to-last one and, with my back to her, took out the pendant from my jacket pocket and placed it on top of the glass. I called out, "Hey did you see this one?" She came back over, looked at the object on the table, and said, confused, "Why is this one out of the case?" "Check out the inscription on the spine," I replied. She picked it up, saw the words "On Longing," and burst into tears. We embraced and I put the pendant around her neck. It was a perfect moment.